In the hunt for a new massive planet beyond Pluto (sometimes called Planet X), DTM staff scientist Scott Sheppard has been continuing his survey of the night sky with David Tholen (University of Hawai’i) and Chadwick Trujillo (Northern Arizona University) looking for very distant objects in the outer solar system. During this search, Sheppard and his team pointed their telescopes near Jupiter and discovered two new, mile-wide, moons of Jupiter, S/2016 J 1 and S/2017 J 1 (“S” for satellite, “J” for Jupiter), both announced in early June of 2017. NASA's Hubble takes a close-up portrait of Jupiter in April 2017. Credit: NASA, ESA, and A. Simon (NASA Goddard). A movie of a newly discovered Jupiter moon, S/2016 J1, showing its motion relative to background stars and galaxies. Image by Scott Sheppard, DTM. Several lost moons of Jupiter were discovered in 2003, 14 of which were still classified as missing at the beginning of 2016. During their survey, Sheppard and his team recovered five of these lost moons by linking their one year of observations in 2016 and 2017 with the lost moons observations in 2003. Although they likely have all of the lost moons in their new observations from 2017, they still need to link the remaining lost 2003 objects with another year of observations to confirm the linkages, which will not happen until early 2018. A movie of a newly discovered Jupiter moon, S/2017 J1, showing its motion relative to background stars and galaxies. Image by Scott Sheppard, DTM. Sheppard and his team confirmed the two new moons, S/2016 J 1 and S/2017 J 2, were not lost moons by having over one year of observations on both and finding they did not link to any past Jupiter moon observations. 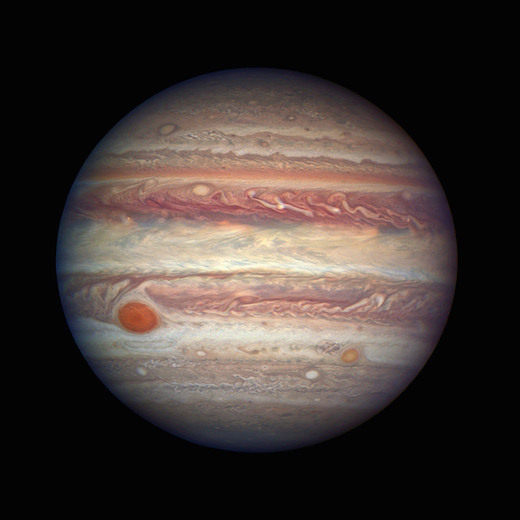 This gave them two new moons, bringing the total number of known moons of Jupiter to 69. Although there are likely a few more new moons hiding in their 2017 observations, Sheppard and his team will need to reobserve them in 2018 to determine which of them are the remaining lost 2003 moons and which are actually new moons. Stay tuned!